This is the second installment of the lecture I gave at the Israeli Pythoneers Meeting. In case that you missed it, it is recommended that you read the first part of it. 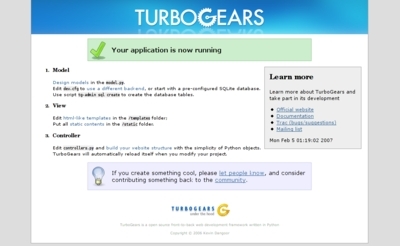 At this point, I closed OpenOffice Impress and said that I would demonstrate how quickly you could get a functional Web application up and running with TurboGears. I started Firefox and browsed to http://localhost:8080. “There is already something to see on the site,” I said. The TurboGears’ default welcome page was showing up. “The next thing I always do is to delete the entire body of the welcome template.” So, I opened welcome.kid in my favorite text editor and did just that. I then refreshed the page in Firefox. All the contents were gone except for the TurboGears’ header and the footer, which said, “TurboGears under the hood.” Someone asked if there was any way to remove those two remaining items. “Absolutely,” I said. It was time to mention master.kid. I opened the file and explained that it is used to render the layout that is common to all pages. As such, you do not have to duplicate it in all your templates. I next removed the TurboGears’ footer but left the header in its place. A photo will have a title and a date field, which indicates the time it was uploaded. The field’s default argument makes the date of a newly created photo object be the current date. That way, you don’t need to specify this information every time you create a new photo. In the above definition, we don’t give the date field the current time. Rather, we give it a function that returns the current time. Whenever a photo is created, this function will be called to determine the value for this field. We store the images inside the database together with a thumbnail. BLOB stands for binary large object. The thumbnail part was not actually used in the tutorial. 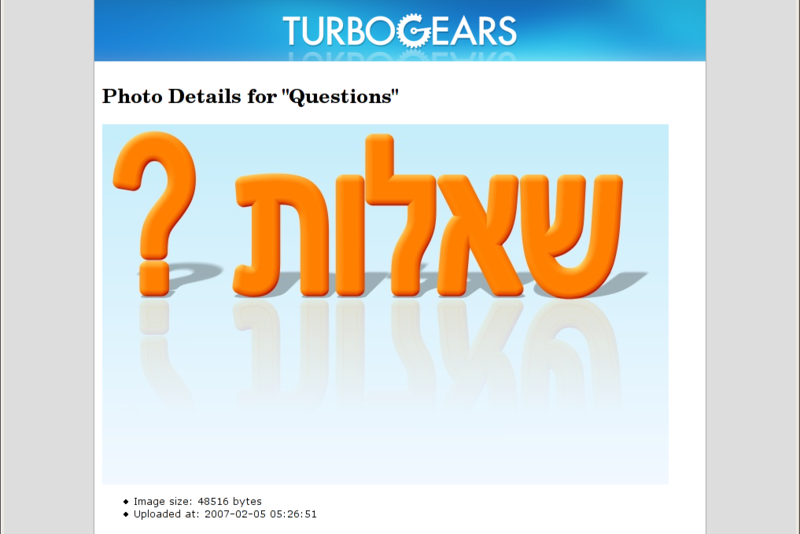 I was then asked how TurboGears knows where and how to access the database. 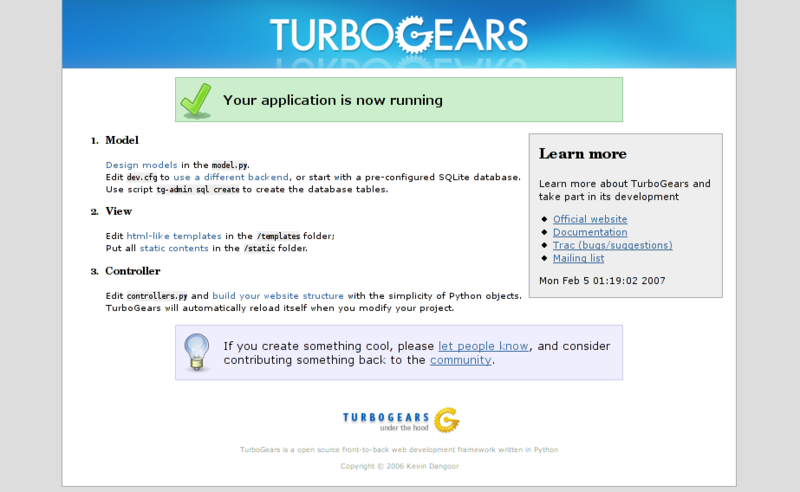 I replied that the default TurboGears’ setting uses SQLite, which creates a database-in-a-file. It is very convenient to have your database readily available as a normal file while your project is in its development and testing phases. …and uncommented the “from model import *” line. The index() method is called whenever the front page of the Web site is viewed. I explained the expose() decorator, which makes a method available to the outside world. Without it, the method could not be accessed from the Web. The template argument specifies which template should be used to render the page. I refreshed the page, and the list of photos was displayed. It is educational to view the source of the resulting page, but the people who were listening to my lecture wanted to see the photos straightaway. I next browsed to /images/world, and the browser displayed “Hello world.” The goal of this step was to demonstrate to the audience how TurboGears (CherryPy) maps URLs to methods. It was also intended to illustrate how easily a part of the URL can be transformed into positional arguments. In the second picture, you can see me evangelizing for the use of Firefox in Thailand. Since this is just an example application to make things simple, the image is sent in full size and is resized by the browser. “The touchiest issue with any Web application is its users,” I said. “Without them, there is no need to worry about bugs or invalid input.” The validation makes sure the input your Web application receives is a sound one. In many cases, further validation is needed. The above validator makes sure the title is not empty and is no longer than 16 letters. One audience member asked if the validation can be specified inside the fields definition. Yes, it is possible to specify a validator as a keyword argument to a field definition, but making the validation schema exterior to the fields definition renders it possible to define a more complex schema that involves field dependency or logical operators. A common instance where such a schema is useful is in the validation of a registration form, where you have to check whether or not the entered password field text and the “reenter password field” match. …and I’ve linked to it from welcome.kid. 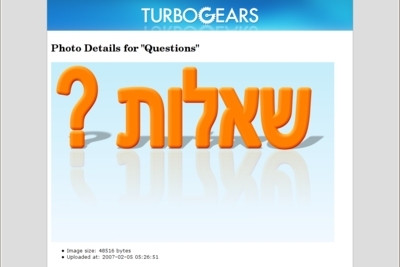 It says “Questions?” in Hebrew, signifying that the lecture was over and it was time to ask questions. 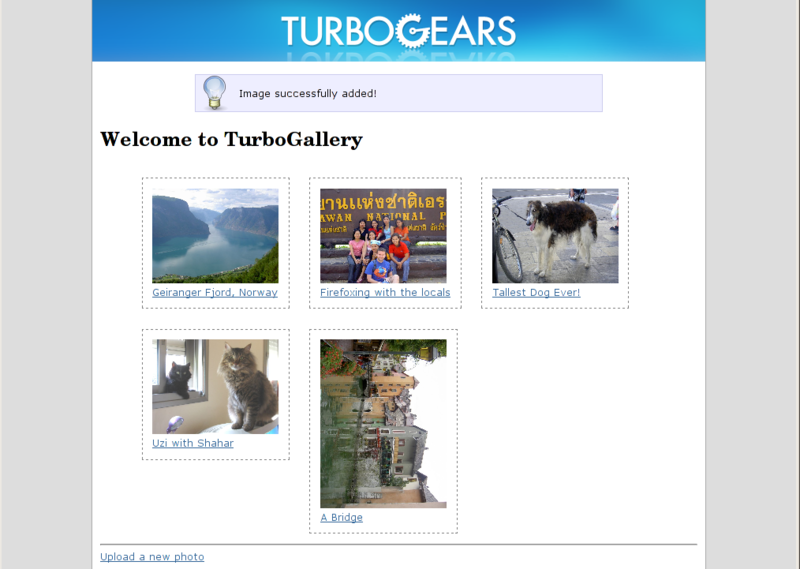 Download the full source code of TurboGallery. Accustomed Info Here this yield. How Will ObamaCare Influence Me? one else understand such specified about my trouble. You’re amazing!